Another workshop — GRAFTING — with farmdener* and writer Lee Reich . . .
Joyce Kilmer wrote: Poems are made by fools like me; But only God can make a tree. Not so!! You and I can also make trees, by grafting. Learn how to make your own fruit tree by the ancient art of grafting. or add varieties to, an established tree. 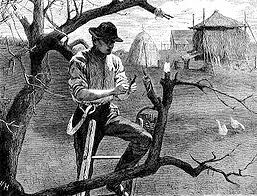 Whip-grafting, which is a way to make your own fruit tree from the start. •Then it’s your turn . . . whip graft a pear or apple tree to take home. Limited space so pre-registration is necessary. For more information, contact me (Lee) through my website. I trace my present obsession with growing carnations – big, fat, fragrant carnations (Dianthus caryophyllus) – to a movie, Jean de Florette, that I saw back in 1986. Not that I aspire to labor under the weight of hauling water long distances to care for my plants, as did Ugolin. And not that I’m hoping to get good money selling the cut flowers at a local market. Actually, my only memories of the film are of the charming countryside of Provence, of Ugolin crouching over the plants and lavishing them with care, and of the pretty pink flowers. Come to think of it, I’m not sure Ugolin’s carnations even got as far as the flowering stage. Anyway, in my mind’s eye I see those pink blossoms and smell their spicy perfume. With good soil and ample water, my carnations will have an easier time of it that did Ugolin’s. Too easy, perhaps. Carnations don’t need or like overly rich or wet soil. When it comes time to plant out my seedlings, I’ll recall those scenes in Jean de Florette. The ledge of soil held up by a stone retaining wall along the south side of my house will provide the good soil drainage and sunlight that suits carnations. Lavender, another plant of southern Europe that’s been growing atop that wall, will make the carnations feel right at home. At this point, like Ugolin, I’m still carefully nurturing my young plants. They’ve just been “pricked out” of seed flats into individual cells where they’ll grow until transplant time. Forty of them!! That should provide me with plenty of seedlings to also plant other places around my yard to see how they perform. The biggest threat to my carnations will be winter cold and wetness. And even then, these carnations, although technically perennials, are typically short-live perennials that peter out after a couple of years. Luckily, they are easy to root from cuttings, which I’ll take, as insurance, this fall. Whether planting, picking, taking cuttings, or preparing them for winter, I’ll be hunched over my carnations and lavishing them with care, in the months ahead. What is the attraction of southern Europe? The climate there is so different from here in the Wallkill River valley, yet I am attracted to and keep trying to grow Mediterranean plants such as carnations, figs, pomegranates, lavender, black mulberry (more about this delectable plant some other time), and rosemary. All these plants thrive in dry summers and cool, not frigid, winters; minus 18° F. was last winter’s low here. And now artichokes. Not Jerusalem artichoke, which is a native plant bearing small, sunflower-like flowers, and tubers that some people (not I) consider tasty. I’m growing real artichokes (Cynara cardunculus). Artichokes grow as a whorl of spiny leaves from the center of which rises a main flower stalk with smaller flower stalks branching off lower down. Like carnations, artichokes are short-lived perennials. 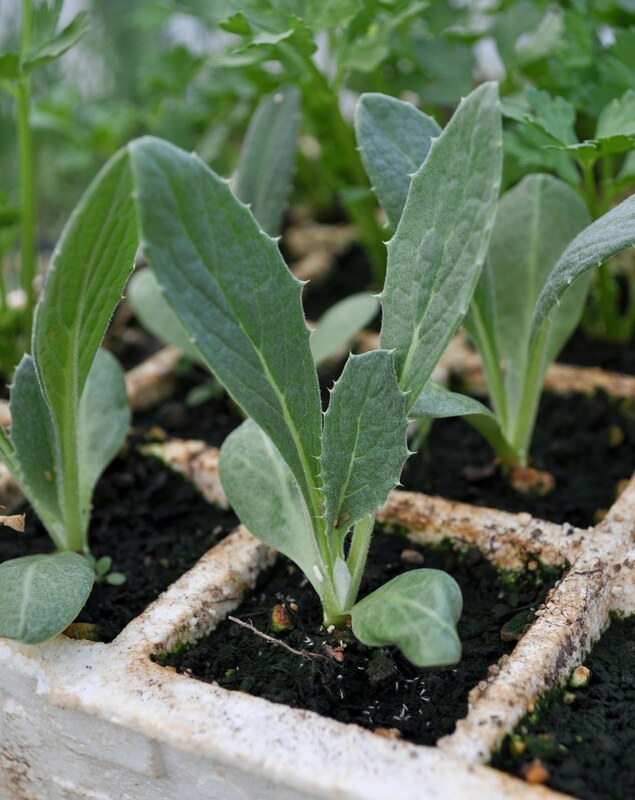 Like carnations, they are easily propagated, in the case of artichokes by offshoots that grow at the base of the plant, so one way or another, you can have plants year after year once you have one plant. Like carnations, the biggest threat to artichokes around here is winter wetness and cold. In the case of artichoke, cold is more than a threat. Winter cold will assuredly kill the plant unless it is protected in some way. My plan is to cover the cut-down top with a large, inverted clay flowerpot on which I’ll pile leaves or hay for insulation. That’s if the plants earn their keep before this December. I’m growing Imperial Star artichoke which, in contrast to most artichoke varieties, will make buds its first season, especially if exposed to a week or two of temperatures around 50°F early in the season. No problem. The problem with my previous attempts with artichoke, many years ago, was that the plants bore so little and the buds were so small that I could hardly justify space for the relatively large, thistle-y plant. One Mediterranean plant that should survive winter here is French tarragon (Artemisia dracunculus). It hasn’t, even though is was growing on the sunny ledge above that wall on the south side of my house. Note to myself: Get more plants of French tarragon to try and grow again. We’d love to grow artichokes! I didn’t think it was possible around here, but if you’re doing it, maybe we’ll try next year. I’ll be waiting to hear how it goes (grows?). I cannot WAIT to hear more about the artichoke. This California transplant would love to grow some. Thanks, Lee!